Like the previous issue, The Flash: Season Zero #22 is a flashback devoted to Len Snart and Mick Rory and their criminal careers before they became Captain Cold and Heatwave. It is revealed that the two crooks exemplified their respective elements long before they got their hands on high-powered super-guns. 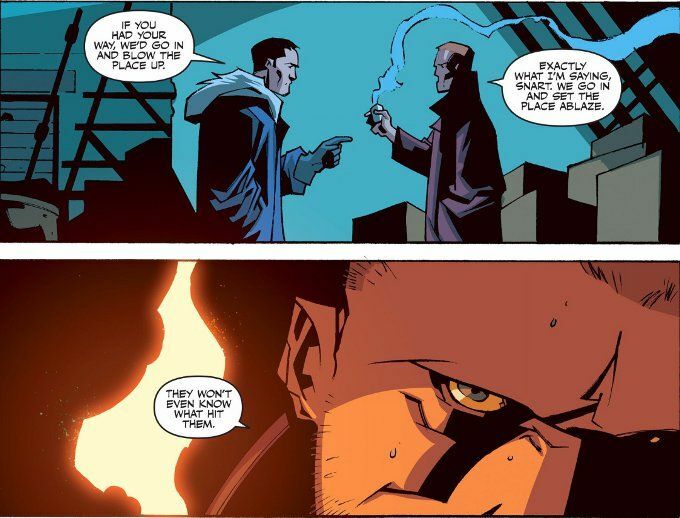 More, we see why the calculating Snart works with a loose cannon like Rory. The script captures the attitude of the characters from the show perfectly. Nevertheless, some of the action doesn't make a lot of sense. I can swing with Rory's plan to throw off the police by setting the museum they're robbing on fire before they go in. The problem is the plan doesn't work (despite the burglar alarms being disabled) and the police somehow beat the fire department to the museum, purely because we need a reason for Joe West and his partner to be there. This issue is a great character piece but it strains credibility as an action sequence. Thankfully, the artwork saves the issue. This is the kind of story Phil Hester draws best and the inks by Eric Gapstur beautifully enhance Hester's pencils. But what really makes the artwork pop is Nick Filardi's colors, with a palette of strong oranges and cool blues creating a perfect visual representation of our two main characters.